I remember watching the Newton city [professional] fireworks display on the hill at Fessenden two years ago with a group of families from my elementary school. One little boy ended up at the hospital that night. The culprit: those glow in the dark sticks. The boys were sword fighting and one opened up and the goo landed in his eye. The Fourth of July is drawing near and barbeque preparations are underway. Fireworks are a traditional part of Independence Day celebrations, but they can also be dangerous. 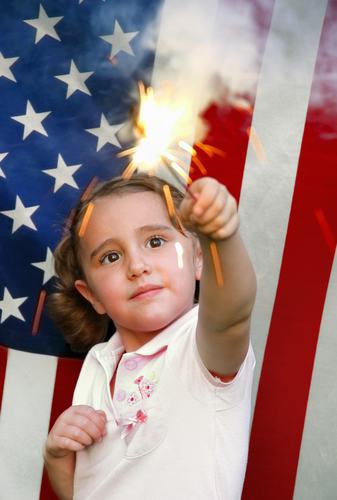 Sadly, children and teens are too often hurt by fireworks. So, before the celebration begins, get your EyeSmart fireworks safety tips from the American Academy of Ophthalmology. A 6-year-old child’s eye was severely injured after he lit an M-80 firework that he found in his home. He called 911 (mp3 audio) and underwent an immediate cornea transplant and lens replacement, and required several additional eye surgeries. A 12-year-old boy forgot to unwrap the fuse of a fountain firework, making the fuse too short. It exploded almost immediately and blew up in his face, seriously injuring his eye. Even sparkers are dangerous. Sparklers typically burn at 1,200 degrees Fahrenheit and cause 27 percent of all fireworks injuries, including third-degree burns. Bottle rockets cause some of the most serious eye injuries. Errant bottle rockets can injure bystanders and cause eye lid lacerations, corneal abrasions, retinal detachment, optic nerve damage, rupture of the eyeball, and complete blindness. One in every six fireworks-related eye injuries results in permanent vision loss or blindness. If you experience an eye injury during a fireworks accident, seek immediate medical help. For more fireworks safety tips or to find an eye M.D.in your area, visit www.geteyesmart.org. Please be safe everyone! The ER is no fun on 4th of July!